The sad fact is that I should never be allowed out on my own. Because what happens when I am? I come home with a bag full of books, that's what! 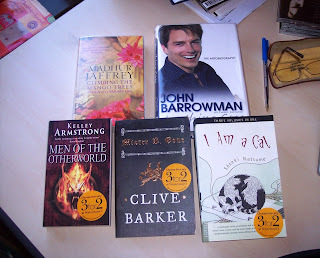 The Waterstones' haul started with Men of the Otherworld by Kelley Armstrong, which I saw blogged about very recently but can't now remember whose blog it was. Sorry. I knew I had to have it though and grabbed it fast when I saw it. On the same shelf was Mister B. Gone by Clive Barker, which has intrigued me for quite a while, so I nabbed that too. So then I was faced with finding another book to take advantage of the three for two offer and I found I am a Cat by Soseki Natsume. I've never read anything by anyone Japanese and this classic 'cat' book looks like an excellent place to start. So after the library and Waterstones the next stop - obviously - is the Oxfam charity shop... it is, after all, on the way home! 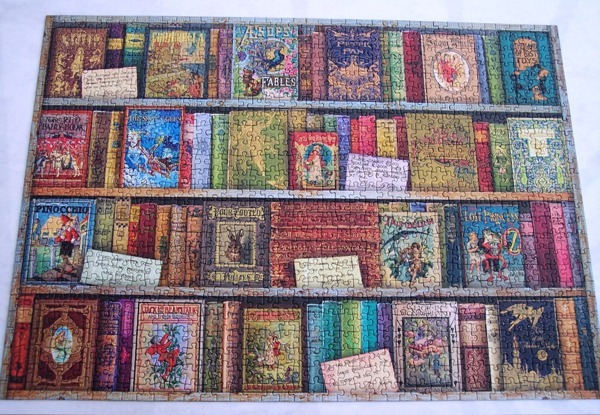 There I found a Persephone - Minnie's Room by Mollie Panter-Downes. I've read it, of course, but don't own it, and as it was undoubtedly one of the best short story anthologies I've ever read, there was no way I was leaving it on the shelf. 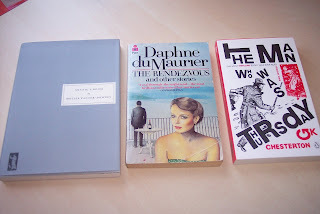 I never leave Daphne du Maurier anthologies behind either and The Man Who was Thursday came home with me because G.K. Chesterton's Father Brown stories are brilliant and I'm wondering if his novels are as good. So, there you go. Ample proof that I should never be allowed out on my own. I can't believe it's taken me two weeks to read The Jewel of Seven Stars by Bram Stoker. I know I've been rather busy with something else, but even so... Anyway, it's finished at last and I'm wondering how on earth to review it as it was rather a complicated tale... not as regards plot, just the way it was written. The story concerns a young lawyer, Malcolm Ross, who is called to the Trelawney household in London, late one night. A girl he met at a picnic, Margaret Trelawney, and felt an instant attraction to, has called upon him for help. Her father was attacked in his bedroom, late one night, by someone or something and has lapsed into a coma. A bedside vigil ensues, during which the carers are almost overcome by what they think is fumes from a mummy, Mr. Trelawney being a keen Egyptologist and having a houseful of artifacts, the weirdest of which are in his bedroom. Eventually, after four days, Trelawney comes round and there's a long tale to be told concerning a Queen Tera who made certain plans to resurrect herself, centuries in the future. The group, including Malcolm, Margaret, a doctor friend and an Egyptologist friend of Trelawney's make plans themselves and remove to Cornwall to carry them out. The first thing I would say is that this is not an easy read. I thought it was just me but when I went back and read the introduction I found that when the book was published it got mixed reactions and many people thought it was over complicated and, apparently, subversive in that it questions religion. The plot itself is fun; Egyptian jiggery-pokery is always a bit exciting, what with the discovery of tombs in the desert and curses and whatnot. And I did like the sections where adventures finding artifacts were retold. In that respect it was a typical Edwardian tale of the supernatural with stories within stories and a lot of explanation, much like a couple of Sherlock Holmes novels I've read. The romantic aspect was also quite nice. Malcolm is so devoted to Margaret, come what may, and that's nice to read in a book written by a male author. All that said, I found this book hard going. Stoker's writing is very dense and he goes off on tangents that I didn't really notice in Dracula. Sometimes twenty pages in one sitting was more than enough! His writing could hardly be called 'crisp and to the point' like say, Conan Doyle's. I certainly didn't dislike the book or I would never have finished it, but it was hard work. I'll read more Bram Stoker, but not for a while I suspect. My second book for J.Kaye's Support your local library challenge. The "Letter Meme" has been going the rounds and I decided to let Deslily give me a letter. The idea is to name ten things that you love that start with that letter. Pat gave me the letter 'M'. 1. Mousehole. 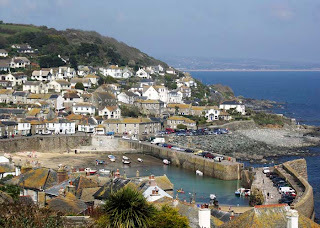 Pronounced 'Mowzal', this is a fishing village in Cornwall. I'm not actually from the village, I'm from Penzance, about 5 miles away, but I had uncles, aunts and cousins who lived there and thus spent quite a lot of time there during summer holidays. It's the kind of place that gets under your skin, full of history and a sort of unchanging atmosphere. I love it. 2. Maps. This one is self explanatory. I just love maps. Any maps. Be they road maps, antique maps, maps in fantasy books - doesn't matter, I love 'em all. 4. Music. I like classic pop, c/w, folk... typical child of the 60s really. 5. Masterchef. This is the BBC's cookery competiton show. Good cooks competing for the title of Masterchef. I never miss it. 6. Murder mysteries. I'm just getting into crime books and I don't like them all by any means. But when I pick carefully I often find them unputdownable. I think perhaps I might be a 'closet' crime fan. 7. Mountains. I'm not sure we have 'serious' mountains in the UK. The USA has them though and I really loved The Blue Ridge mountains, The Great Smokeys and The White mountains of New Hampshire. 'One day' I hope to be lucky enough to see The Rockies. 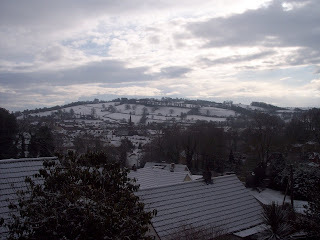 I don't think I could ever live anywhere that was too flat - I have to have hills. 8. Mushy peas. Delicious with fish and chips and a slice of bread and butter. I am becoming seriously old in my tastes. 9. McCaffrey (Anne) The best writer of dragons ever, in my opinion. Her early books affect me like no others. 10. Marigolds. Not the rubber gloves used for washing the dishes. Nor even really the African variety beloved of park or town bedding all over the UK. No, I mean your old fashioned, cottage garden, 'pot' marigolds that seed themselves, flower unstintingly all through the summer and autumn, attract butterflies... and you can even eat them. And they just look so cheerful and pretty. I call that a really spiffy plant. A nice bookish day today. 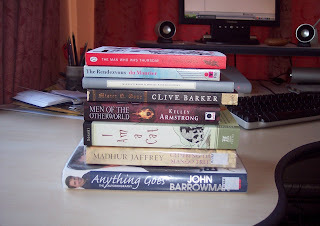 I went to Waterstones and was able to enjoy a half hour's browse among the new books. Not much to tempt me really, but I did buy this and also picked up my copy of this which you get free if you have a Waterstone's loyalty card, which I do. It's worth having the card just to get their free magazine, to be honest, as it really is very good, and one of the very few book magazines available in this country. Which always strikes me as a big shame. More disappointingly I've just given up on a book. I really hate to do this but The Fade by Chris Wooding just wasn't doing it for me. It's hard to put my finger on why because I usually like this kind of sci fi novel. Partly, I think I'm not fond of the kind of female character some male authors write where she's clearly a man in women's clothes. Not much depth there at all to be honest, and the plot is dragging, 100 pages in and I'm still waiting for something to happen. It's a shame. I tend to get annoyed, not just by the wasted money, but also by the wasted reading days. I could have been reading something good! 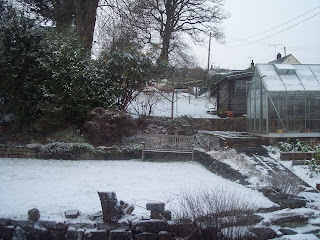 Anyway, most of our snow is now gone although it is still perishing cold. 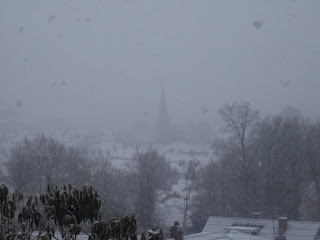 We've been told to expect more tomorrow and Friday but, in the meantime, here're a few pics of *my* snow. 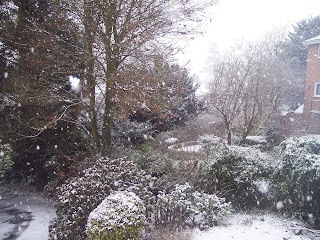 I'm aware it might not look much to folk who live in proper snowy climes but we hardly get any snow in these here parts, so this was a bit special. 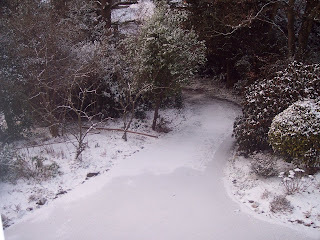 The first three are of our front garden. I'm sure there must be a *lot* more. Looking at the list it does seem that two genres are well catered for - YA fantasy and crime. I'm sure there must be many more in other genres? And I'm racking my brains trying to think of the Georgette Heyer where the hero and heroine get stranded because of snow. Is it Sylvester? Or am I thinking of some other regency romance? Anyway, thanks to all who contributed and anyone that can add to the list, please do. 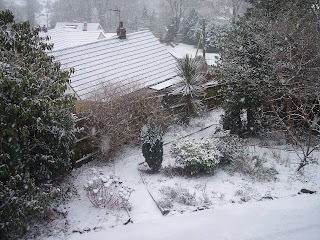 Our back garden. A trifle parky to be sitting on that seat, reading, at the moment but it's a lovely spot in the summer. 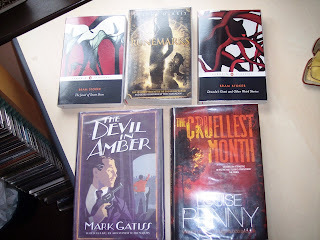 The Cruellest Month by Louise Penny is the 3rd. book in her Inspector Gamache series, set in Quebec. I've really enjoyed the first two books and am ready to read this one now. Especially as I think there is now another new one out! The Devil in Amber by Mark Gatiss is the 2nd. book in his Lucifer Box series. I read the first one a couple of years ago, enjoyed it, and would like to read this. 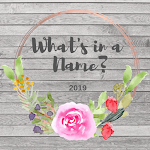 Runemarks by Joanne Harris... well, I *know* I've heard someone, somewhere, mention this book and say that it was quite good. So I nabbed it. Quite pleased about this one. The Jewel of Seven Stars by Bram Stoker I've not heard of but as I loved Dracula and this one is set partly in Cornwall and in Egypt it sounds like it might be my kind of thing. And the other book of short stories by him, Dracula's Guest and Other Weird Stories, has got to be worth a look! It's a modern building, only a couple of years old. 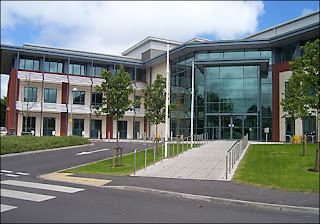 Because of that I gather it's one of the Devon 'flagship' libraries and thus we get a good choice of books both old and new. 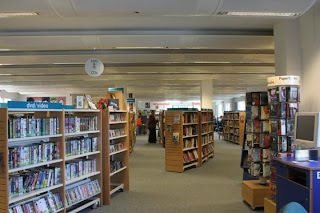 The library part is to the right of this photo (not mine, found on the net) but more or less mirrors the other side. 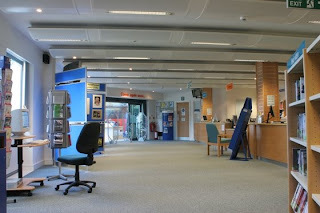 What's missing from this photo is the new scanning device machines. We no longer book books in and out with a library assistant... we do it ourselves. I'm not sure what I think about this. It's actually not that much quicker and surely it must eventually put people out of work? 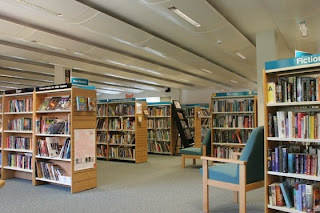 So, that's a brief tour of my local library here in Tiverton. It's a place I spend quite a lot of time in - although heaven knows why as I have a personal tbr pile of about 300 books! (I choose not to think about it...) But if you don't use it, you'll lose it and anyway FREE books! What's not to like?